I appreciated that a young girl with outstanding looks and to-die for gorgeous curly tresses was making a name for herself in the harsh film world. But then when I happened to watch “Fashion” and I was immediately taken aback by her guileless face but strapping acting prowess. But she was still one of the many. But then came “Queen” and I was a fan for life! I guess that was also a pivotal point in not only her career but also her personal styling. I would not say that she was badly styled in her early days, but she still had some remnants of her small town upbringing – which in my opinion just added to her charm. But now she has metamorphosed into a total fashion icon. When I started researching for this saree post, I was not too hopeful. I expected most of her photos online to be more western, but I was in for a huge surprise. She has created quite a wave with her Saree looks and how! 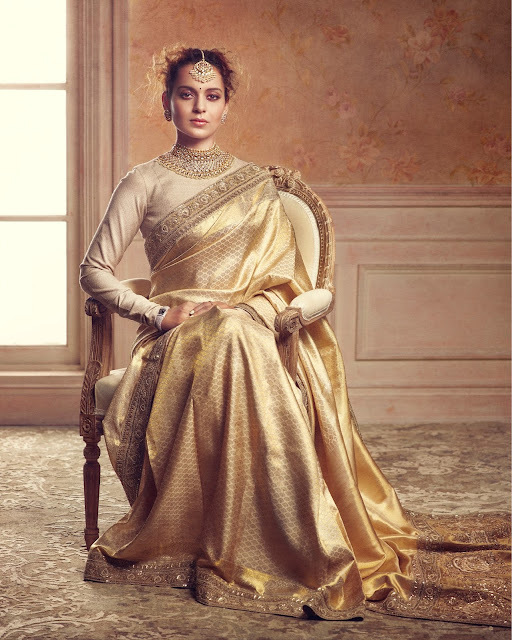 And just like her on-screen performances, she has given every look her own personal twist making it unique and memorable – just like Kangana herself! Scroll down ad see for yourself. The designs you have shown those rally deserve the tag of India's most elegant designer sarees And in this post I would like to buy printed sarees online. All the sarees are looking gorgeous..designs and colors are too good..
they are trendy..collection was fabulous..i loved it..